The TOURTECH VM50 dynamic microphone 3-pack gives you three of these excellent microphones in a money saving bundle. Money Saving Microphone.. The TOURTECH VM50 dynamic microphone 3-pack gives you three of these excellent microphones in a money saving bundle. Already incredibly affordable, this 3-pack brings together three of the VM50 dynamic microphone at an even better price! An excellent choice for kitting out the whole band or for miking up your drum kit. The TOURTECH VM50 dynamic microphone 3-pack comes with three VM50 microphones, a padded and extremely durable tour-case and three microphone clips so you’re ready to hit the road as soon as it arrives. TOURTECH have designed the VM50 dynamic microphone to be suitable in all manner of applications from vocals to guitar amps to drums so it is extremely versatile. The VM50 dynamic microphone has a supercardioid polar pattern and an internal pop shield so it’s ready made for capturing excellent, studio-quality vocal recordings. Thanks to its high SPL capability of up to 135dB though, you’ll also be able to use the TOURTECH VM50 for miking up your guitar amp and drums and enjoy the same fantastic results. Made for professional use, these microphones are extremely durable. A metal alloy makes up the chassis and it’s scratch resistant too, so it’s ready to take a beating on the road. The capsules are protected from bumps, drops and abrasions thanks to a steel mesh grille at the top. Furthermore, these microphones come to you in a padded hard case so they’re ready to hit the road straight away. 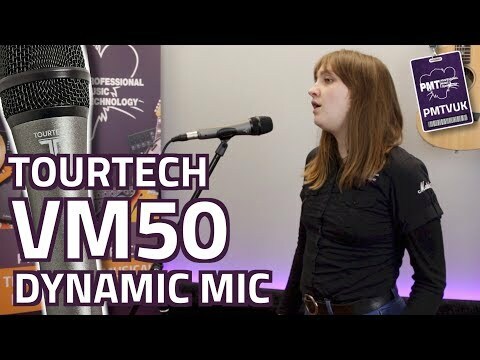 Buy the TOURTECH VM50 dynamic microphone 3-pack from Professional Music Technology for a fantastically money-saving microphone set that produces professional results.